It is rare to get such a detailed context for the purchase of a book, but either Kinsolving himself or an astute librarian had a keen eye for this particular item’s posterity: the temporal context, when cross-referenced with Kinsolving’s biographical details, reveals that this book was purchased while Kinsolving was abroad during the first World War. 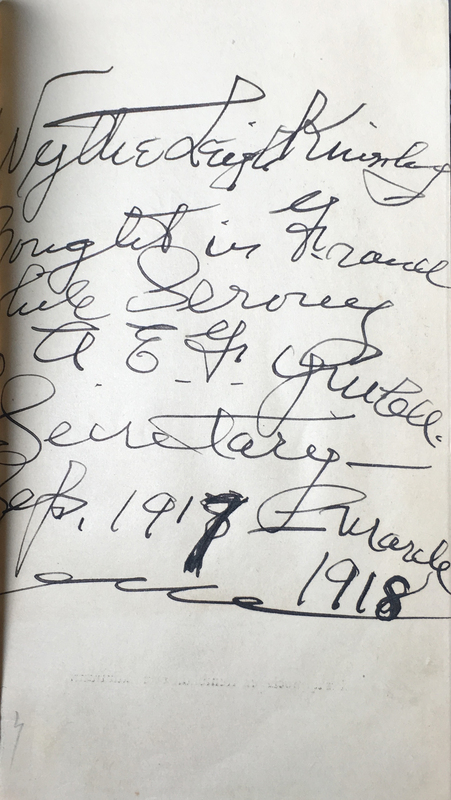 Originally, when the Book Traces team found the inscription, the word “serving” led us to believe that Kinsolving served in the armed forces during the War. We were perhaps misled because the Book Traces project (at UVa and beyond) has indentified two additional traces from American Civil War soldiers who memorialized their stints in military service. This was, however, not the case with Kinsolving. A fervent pacifist and a devout Christian, Wythe Leigh Kinsolving primarily identified as a Reverend and a religious journalist. He was born in 1878 in Halifax, Virginia, and received his formative education in other parts of the state: he earned a Master’s Degree at the University of Virginia in 1902 and a B.D. degree at the Virginia Theological Seminary in Alexandria in 1906. He then married and served as a minister in Maryland, Missouri, and Tennessee. When World War I broke out in Europe, Kinsolving chomped at the bit to be allowed to serve as an official minister. Finding that all of those positions were filled, he applied to work at the Young Men’s Christian Association (Y.M.C.A.) in Paris. It is very appropriate that Kinsolving purchased a book of fairytales while in Paris because his experiences there were very rosy indeed. Knowing what we now know about the new form of warfare’s traumatic effects on the psyche of soldiers, it may be hard for us as modern readers to stomach some of Kinsolving’s shockingly out-ot-touch descriptions of the war. In his memoir of his time in Paris, From the Anvil of War (1919), he compiles his literary output from from 1914 to 1918: his correspondence, his journalism, and his attempts at poetry that, from a technical standpoint, are thoroughly mediocre. “Did they lose their grip in the trench in the long dread hours? “My heart hath been in France! These many days my heart hath been in France. I’ve lived amid the storming crash of guns! I’ve knelt beside the wounded soldiers there! Caught first glimpse of her and saw her yawn. Falls ere it reaches you with light divine! Taken in conjunction with the aformentioned “Tribute to France” and testimonies in his correspondence of French soldiers eagerly awaiting American troops’ arrival, it seems as if Kinsolving is not only exoticizing the beauty of French women but also casting strapping American G.I.s as the savior of the “dainty” France. Returning to the book of fairytales, it is not difficult to see that our author has also overplayed his knowledge of the French language. Though he makes myriad mentions of instances in which he spoke in French to Frenchmen and indeed boasts that “French people tell me they understand me perfectly” (16), traces in the volume of fairytales, which I assume to be written in the hand of the book’s original owner (albeit probably a different hand than that of the inscription despite its loopy cursive) betray a certain lack of familiarity with the language. This intervention follows the trend established in the front matter: Kinsolving (or at least those conscious of his legacy) liked to add geographic data to literature. 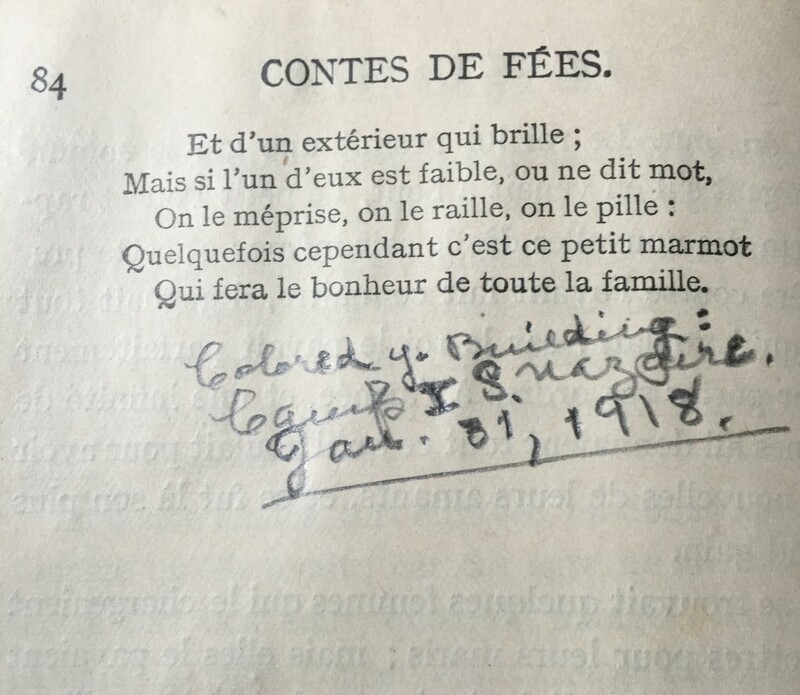 Just as the inscription at the beginning tells us that Kinsolving bought the book in France, this address at the end of “Tom Thumb” seems to suggest that it was in this location that Kinsolving puzzled his way through the French story, translating the unfamiliar words. If Kinsolving was merely using the page as a spare sheet of paper to commit an address to memory, it is unlikely that the address would be centered on the page and underlined; this alignment and demarcation insinuates a connection between the story and the handwriting. A building in which tens of thousands of doughboys received comfort and refreshment during the trying days of the War and in the restless anxious period of home-going. 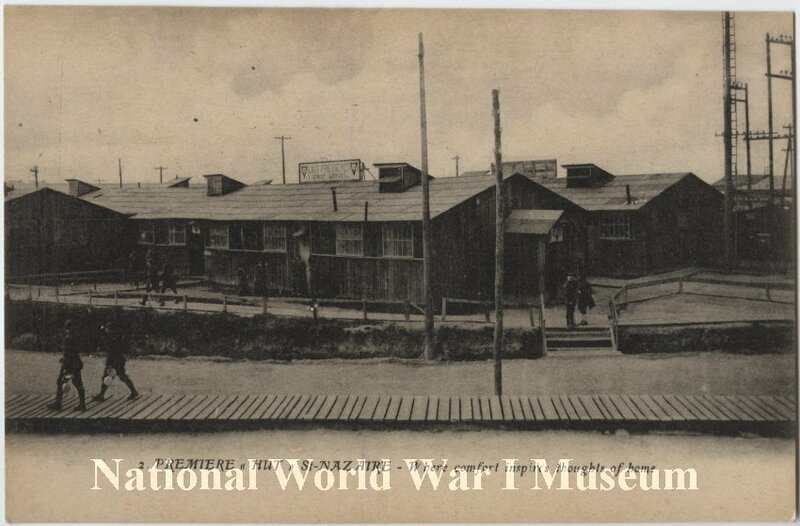 Approximately 2,000,000 letters were written by the soldiers here. It is fitting that this same site where Kinsolving engaged with foreign-language literature was also the locus of literary output in the form of soldiers’ epistolary writing. It may even have been this place-based incentive for writing that propelled Kinsolving to pair his own writing and his literary acquisitions with geographic data. We have also seen this tendency to geographically situate recollections of war with our other Book Finds from the American Civil War: Private Robert E. Jones wrote in a book of William Cowper’s poems that he was “on the line” at Richmond less than a month before his death, and a writer identified only as James R. reflected in a letter to Thomas Randolph Price upon his service twenty years prior in “dear Richmond.” Though Kinsolving shares a tendency to root his reading and observations in time and space with these veterans, they are notably much less flowery and even curt in their recollections of the war; these locations are their only definitive traces. Even as these Confederate soldiers express some nostalgia for Richmond in their writing, they steer clear of Kinsolving’s sensationalist tendencies. Indeed, Kinsolving seems to use his geographic data to a dramatic end rather than merely noting a location for posterity. The annotation of “Tom Thumb” specifically becomes more meaningful with this geographic context: soldiers who felt small fighting an impossible enemy in the trenches could once again find dignity and purpose at Camp No. 1 just as the main character of the fairytale learns to respect himself in spite of his shortcomings after singlehandedly defeating a fearsome ogre. Though Kinsolving presents us with a view of World War I through the rose-colored glasses of an eager reverend on his first extended trips abroad in the land where Western fairytales were written, it is clear that he and his colleagues of the Y.M.C.A. at least afforded “comfort and refreshment” to war-weary men. Perhaps even his optimistic assessments of war, which border on insensitive in a retrospective reading, provided comfort and escapism via his unwavering idealism in the moments when it mattered most. “2002.3.22.” Photographic Print. The National WWI Museum and Memorial. Web. 16 May 2016. Kinsolving, Wythe Leigh. From the Anvil of War. Winchester, TN: Southern Printing and Publishing Co., 1919. Web. HathiTrust Digital Library. 26 May 2016. Perrault, Mme d’Aulnoym Mme Leprince de Beaumont, and Hégésippe Moreau. Choix de Contes de Fées. Paris: Nelson, Éditeurs, 1913. Print. Rathjen, Jamie. “Book Find: Cowper After the Storm.” Book Traces @ UVa. University of Virginia Library. Web. 27 May 2016. <booktraces.library.virginia.edu>. Stauffer, Andrew. “Henoch Arden.” Book Traces. Web. 27 May 2016. <booktraces.org>. Stowe’s Clerical Directory of the American Church 1920-21 (biographial listing of Episcopal clergy). Minneapolis: Andrew David Stowe, 1920. Web. 26 May 2016.